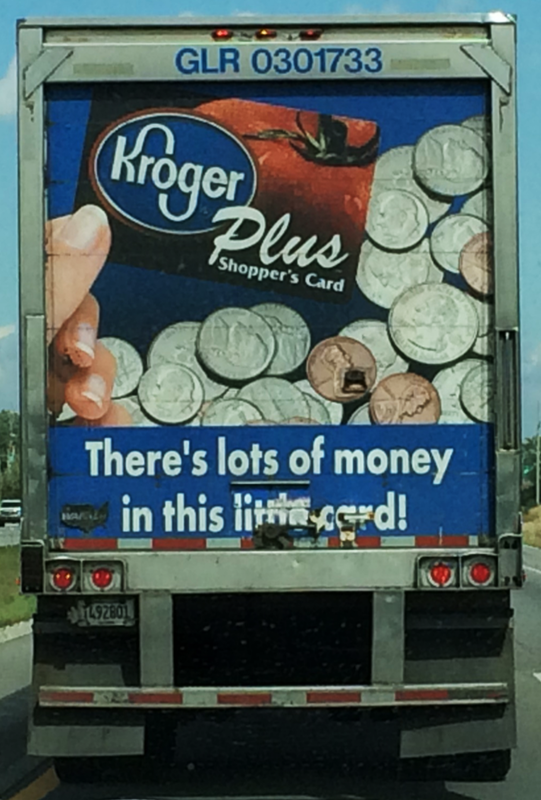 Is There a Typo on This Kroger Truck, or Not? You Decide! The revolution has come to Foster Web Marketing! I’ve hijacked this Typo Tuesday, and we’re heading off in a new direction! Let’s steer this truck…that-a-way! Hello, I’m John Prager, FWM’s resident cranky grammarian. Hannah McNaughton, our Queen of Syntax, asked me to pop in and provide a guest blog in the Typo Tuesday series this week. Well, in fact, it was more of a “put your money where your mouth is” challenge, because we are at loggerheads over whether there is a grammatical error involved, or not. Now, if you were following this truck, you would doubtless tune out the advertisement and continue to your destination. Only later in the day—perhaps as you were trying to drift off to sleep—would you begin to muse about the sign. “Something about that doesn’t seem quite right,” you would say to yourself. Your instincts are sound; the sign is a grammatical nightmare, and it’s all due to those first four words: “There’s lots of money.” Let’s take it apart and see how it works. That apostrophe-S means that there’s is short for “there is,” and we begin by analyzing the sentence as if that is what was written. Now, the word there is an expletive—basically a placeholder. It’s not the subject of the sentence, it has no assigned number, and it has no influence on the grammar of the rest of the sentence. The word is, though, is the verb of the sentence: a present tense, singular verb. And that’s where the trouble pops up, because the next word, lots, is obviously plural. And that word is the subject of the sentence! You can see that lots is functioning as the subject if we rearrange the words a bit to drop out the meddlesome there: “Lots of money is in this little card.” Everyone knows that plural subjects require plural verbs, so the sentence is wrong, wrong, wrong. Kroger should be embarrassed. On the other hand, what happens if we “correct” the sentence to put in a plural verb? Does “Lots of money are in this little card” sound right to you? The defense argument is that the word lots, when followed by a prepositional phrase, can be an exception to the usual rules of singular and plural. When we get specific with the indefinite article and say “a lot,” well, that’s always singular: a lot of bricks, a lot of nonsense, or a lot of words, full of sound and fury, signifying nothing are all treated as singular noun phrases. But when the word is lots, things get hazier. As a rule of thumb, when the word completing the “of” prepositional phrase is something countable, then the thing is treated as plural: lots of third-grade teachers, lots of first-rate podiatrists, or lots of secondhand motorcycle helmets. When the word completing the “of” phrase is not able to be counted because it’s an undifferentiated mass, then everything—“lots” plus the prepositional phrase—is usually treated as singular. Examples: lots of butterscotch pudding, lots of windstorm damage, lots of snow, or lots of money. The Kroger sign? “Lots of money.” So it’s okay to match it with a singular verb. And you are the jury. That’s right, we’re going to keep the comments section for this article open to hear feedback from our readers. If you want to provide more evidence or analysis for one side or the other, that’s fine. If you’re ready to reach a verdict, well, we are waiting to hear about how you arrived at your decision. So weigh in with your opinion! What we’re learning today is that points of grammar aren’t purely academic matters that are resolved by looking in a high-school textbook. They can be living disputes over which reasonable and intelligent people disagree. Take another look at that picture of a truck and ask yourself: good grammar, or bad? The world wants to know what you think. I appreciate the kind remarks. I certainly agree we don't need to be sticklers about formal rules for most types of informal expression. Your cyclist and pop music examples are right on point. I get a little more finicky over commercial speech that tries to persuade me or to assert its expertise. Hannah will be back to continue the Typo Tuesday series in the future, but it was great fun to try my hand at this one. Thank you for reading! Great explication, Mr. Prager! I'm going to say it's fine; let it go. But then, I tend to give a lot of weight to common usage. For instance, I'm not going to tap every idealistic cyclist I see who's wearing a shirt that reads, "One Less Car" and point out the error in the shirtmaker's execution of an arguably laudable sentiment. Or write to Burt Bacharach and demand that he and his lyricist change "One less bell to answer... one less egg to fry... one less man to pick up after." Hope you'll continue the series. Thanks.